Can Los Angeles really handle two Hawkeyes? Just as Kate Bishop reaches out to ask for Clint Barton's help with finding her dead mother, the senior bowman shows up needing help of his own! An unknown party is gunning for him - and their attack kicks off a wild chase across the City of Angels! 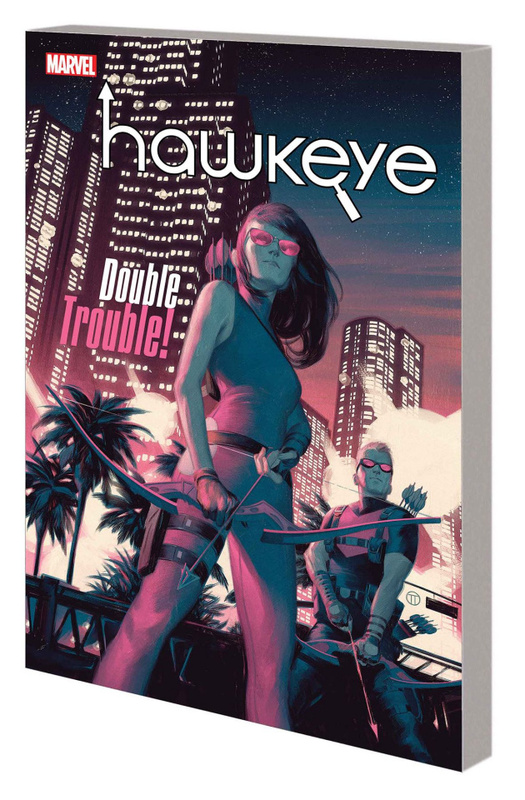 Hawkeye and Hawkeye must try their hardest to stay one step ahead - but who has Clint and Kate in their sights, and what is their sinister agenda? And could they find an ally in Madame Masque? The Hawkeyes are reunited, and it feels so good - if you don't count the two deadly enemies and crew of misfit villains out for their blood! Plus: Kate shares an intergenerational adventure with a younger Clint in the Vanishing Point! Collecting HAWKEYE (2016) #13-16 and GENERATIONS: HAWKEYE & HAWKEYE #1.